This provides an extremely high quality, nutrient dense synergistic mix of broad-spectrum supplements. It has been formulated from years of experience to provide a basic nutritional platform from which to gain health. The main ingredients are the Barley Grass and Seagreens, the others provide a balanced and synergistic nutritional input; the essential need for Vitamin C and its co-factors, have been addressed by incorporating the optimum form of synthetic Vitamin C Sodium Ascorbate, (as always, please see individual product articles for further information) with the full spectrum form of natural Vitamin C in the form of Acerola Cherry Extract, and Wild Rosehip. The bio-flavenoids are further supported by a high quality Propolis extract. Maintenance use: 3g daily. Blend with cold or lukewarm water, or juice. Take on an empty stomach or just before food. For best effect, split into two daily doses. Intensive use: 6g daily. Blend with cold or lukewarm water, or juice. Take on an empty stomach or just before food. For best effect, split into two daily doses. This provides an extremely high quality, nutrient dense, synergistic mix of broad-spectrum nutrients available. It has been formulated from years of experience to provide a basic nutritional platform from which to gain health. The essential need for Vitamin C and its co-factors, have been addressed by incorporating the optimum form of synthetic Vitamin C Sodium Ascorbate, with the full spectrum form of natural Vitamin C in the form of Acerola Cherry with Wild Rosehip. The bio-flavenoids are further supported by a high quality Propolis extract. 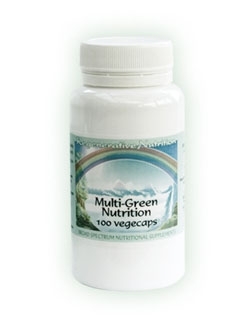 The main ingredients of Multi-Green Nutrition are Barley Grass Juice Powder and Seagreens. Organic Barley Grass Juice Powder is one of the most nutrient dense, land based plants on the planet; being water soluble, it is exceptionally easily to assimilate, even for those whose digestive function is severely compromised. It contains all the nutrients required to support life including a full spectrum of vitamins, minerals, trace elements, enzymes, essential fatty acids, anti-oxidants, the detoxifying and blood building elements of chlorophyll and more. Barley Grass Juice Powder is quite unique from an 'energetic' point of view in that it does not stimulate; in fact it tends to calm an overactive system generally, including calming and improving an overactive/imbalanced immune system. This renders Barley Grass Juice Powder a very useful part of the healing and regenerative process that we can all incorporate in our supplemental regime. It's nutrients, including potent anti-oxidants, can enter into the cells including the brain, helping to protect and revitalise this valuable organ. Seagreens are organically certified, is one of the most nutrient dense plants. Seaweeds contain a higher concentration of minerals (approximately double), than the most nutrient dense land based plants. They also contain a far richer profile of trace elements than land based plants. There are over 90 minerals and trace elements. The sea weeds further concentrate and turn into 'food-state' this rich supply of over 90 minerals and trace elements. Furthermore, Seagreens contain a rich supply of glyco-nutrients, up to 5 of the 8 essential, for cell to cell communication. The nutritional story of sea weeds is exceptional, please see a more in depth discussion of the health benefits of Seagreens in the article. Some points worthy of note are that seaweed has been available as a health supplement both for livestock and human health and nutrition for some time. However, there have been two failings in traditional seaweed supplements such as Kelp tablets. The relatively large amounts of iodine present, may in some individuals over-stimulate the thyroid gland leading to metabolic imbalance. This necessitates a restriction on the recommended dose, e.g. no more than about half a gram daily. Sea Greens Pelvetia is an unusual sea weed in that it typically contains only about one fifth of the iodine content of most sea weeds. This means that doses of two to three grams a day are not contra-indicated. However, there is sufficient organic iodine present to act as a major tonic for the thyroid and 'hormonal metabolism'. The vast majority of sea weeds for animal and human nutrition are heated to a very high temperature to quickly dry the product resulting in complete destruction of the 'live' enzyme content and other delicate nutrients. Careful processing from the nutrient rich artic Norwegian waters, including low temperature drying ensure the product is nutrient and enzyme intact and is one of the reasons for its organic certification. The nutrient profile of Seagreens is such that it acts as a kind of anchor or stabilizer of the metabolism and biological system in general, and this helps us to integrate the more stimulating plants and nutrients, such as Vitamin C, Acerola, Rosehip, Wild Spanish Pollen and Propolis. It is for this reason that a high proportion of the Multi-Green Nutrition is taken up by Sea Greens. Experimentation and observation over several years has proved that many multi-green type formulas over-stimulate the system of many people, as too many stimulating nutrients have been included and these amplify each other, in other words the 'energetic balance' of most Multi-Green type formulae's available are incorrect. More ingredients are not always better. Propolis is a 'master' remedy and has a wide spectrum of health enhancing benefits, including free radical protection and immune and circulatory enhancement. The thymus is a gland that helps to maintain a healthy immune system. It sits between the heart and the thyroid gland and from an energetic (i.e. traditional) standpoint, it is related to the Life Essence. Dr John Diamond, President of the International Academy of Preventive Medicine, found Propolis to be the best of all natural substances to strengthen the thymus gland and hence build up the body's health reservoir and resistance to disease, also possibly to mitigate the negative aspects of ageing. Wild Spanish Pollen makes up 10% of the formula. This has been included due to the exceptional health benefits of pollens, especially in improving vitality. It can help improve the active side of life as well as quality sleep, but for sensitive types or those of poor nervous system, it should only be taken within the Multi-Green, or if taken alone without the buffering aspects of this formula, it should be taken in small doses, increasing gradually, as acclimatization is acquired. Many people take Pollen separately at a dose of one dessertspoon daily. Those of you who are used to a high level of nutritional therapy or who are of a strong constitution can benefit from taking Pollen separately at these sort of doses along side the Multi-Green Nutrition formula. It can still have significant effects, such as balancing the energy of the Multi-Green Nutrition when incorporated at just 10% of the formula. Long term consumption of Pollen has been scientifically been associated with longevity. Liquorice Herb (Glycyrrhiza Glabra), the well known component of Liquorice sweets, is surprisingly one of the most important medicinal herbs on the planet. It has been used extensively in Chinese herbal medicine for thousands of years, in approximately half of their formulas. The reason given, is that it tends to improve the action of all the other herbs and 'harmonise' the action of the herbal formula. More recently, we have come to understand that the adrenal glands need support from this wonderful herb. Most of us suffer from stress of some kind or another even simple electro-magnetic stress. The Adrenals are the most sensitive gland to stress of any kind. This can result in low energy, inflammation and auto-immune disorders or an unbalanced immune system, a situation that is almost universal these days. So our adrenals need support, in order that they can produce the correct hormones to reduce the stress and auto-immune factors. Liquorice is the master herb to do this. Ginger (Organically certified, sun dried to preserve some of the essential enzymes), has been added to complement the other ingredients. Overall, from a traditional 'energetic standpoint the formula is a little cooling. Adding Ginger raises and balances the energy of the formula and at the same time, encourages efficient digestion and circulation hence promoting the distribution of the ingredients via the digestion and circulation. For over 5000 years Ginger was revered as the "universal medicine" by the ancient Orientals of China and India and highly sought after by spice traders. Today, Ginger remains a component of more than 50 percent of the traditional herbal remedies and has been used, over the centuries, to treat nausea, indigestion, fever and infection and to promote vitality and longevity. It is claimed that Ginger can save tens of thousands of lives and billions of dollars in lost workdays. The world's favorite spice is reputed to have qualities that may prevent heart attacks, arthritis pain, aid digestion, prevent colds, flu and skin cancers and aid weight loss. Preliminary research reported in the International Journal of Obesity in October 1992, shows that ginger boosts weight loss by calorie burning. The best example of ginger's anti-inflammatory potential is in the treatment of arthritis. "According to Paul Schullick's 'Ginger Common Spice or Wonder Drug', trials in Denmark showed that more than three quarters of those tested with Ginger experienced relief in pain and swelling. Other conditions associated with inflammation are asthma, painful menstruation and migraines. Multi-Green Nutrition also contains Serrapeptase. This enzyme helps clear, via an enzyme digesting action, debris, especially dead cells and old muco-protein in the body. This will have the effect of clearing the arteries and other major blood vessels of arterial plaque - so important in the treatment and prevention of arteriosclerosis (hardening of the arteries). What is not generally known, is that most of us, as we age accumulate hardened fats around every cell in the body, (thought to be mainly the result of consuming heated and processed vegetable oils, hydrogenated fats and trans-fats, these items are included in most processed foods and especially margarine). So these hardened fats accumulate around and in the membranes surrounding each cell and slow down the transfer of essential nutrients, fluids and oxygen. Also waste products moving in the other direction. Serrapeptase (along with cold pressed oils and raw fats) are thought to be able to reverse this process. The consumption of Serrapeptase tends to also remove inflammation and help to balance the immune system. The amount of Serrapetase in Multi-Green Nutrition, if taken at the full maintenance dose, will supply the equivalent of 1 capsule of neat Serrapeptase. This will supply about half the generally recommended daily dose of Serrapeptse of 2 capsules daily. We supply Serrapeptase separately if required.